The English system of measurement is most commonly used in the United States. 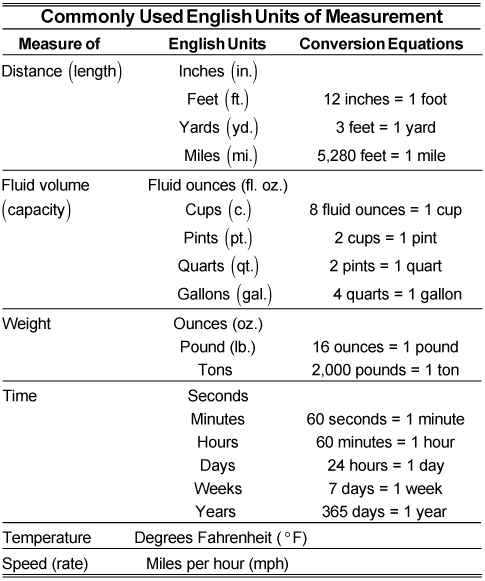 If you were raised in the States, you’re probably familiar with most of the units: inches, pints, ounces, Fahrenheit, and so on. The following table shows the most common units as well as simple conversions from one unit to another. You can use it to answer the practice questions that follow. If you have 420 minutes, how many hours do you have? If you have 22,000 pounds, how many tons do you have? The answer is 28 cups. The answer is 316,800 inches. The answer is 7 hours. The answer is 11 tons.